Mexican Grand Prix organisers have devised a "Plan B" in case Lewis Hamilton wins the world title at the Autodromo Hermanos Rodriguez without finishing on the podium, as happened last year. 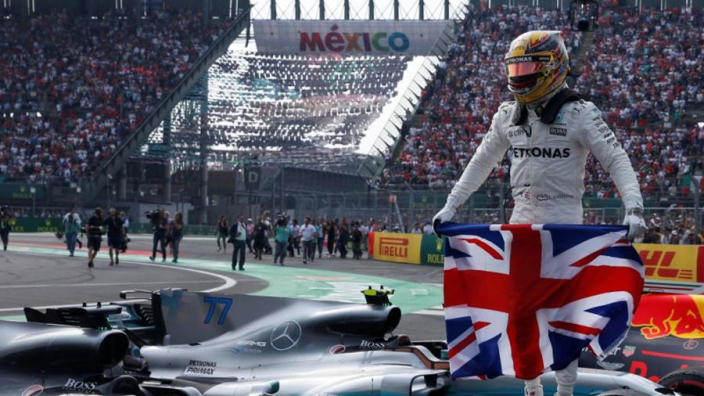 Hamilton won his fourth world title with a ninth-place finish in Mexico, making for bizarre scenes as he celebrated in the paddock while muted festivities were held on the podium. Hamilton only needs to finish seventh in Mexico to seal a fifth world title, and qualified third on Saturday, with both Red Bulls ahead and title rival Sebastian Vettel alongside him on the second row. Although the Mercedes man has vowed an attacking approach into turn one, he may settle into a conservative race in order to make sure of his title coronation, something that has been taken into account this year. "It was great to have Lewis becoming champion, even if he didn't make the podium last year which was a little weird," said race promoter Alejandro Soberon. "We had the podium celebration and we had a championship celebration and Lewis was here [in the paddock] and his team was there [at the podium]. "We're going to be more prepared this year. If Lewis becomes champion here we're going to have a great celebration. "We're really hoping it's going to be a good race. "You discover that F1 and FIA can be more flexible than everybody believes, if you approach them and give them the right idea. "They have been receptive to everything. We're trying not to propose something silly. "We couldn't be happier with the relationship we find with F1 and the FIA. "Everyone is conscious the same thing might happen the same as last year. So we're working on Plan B. "Plan A is very likely that Lewis will be on the podium and Plan B is if he is not on the podium he needs to be celebrated properly."